Legos are great for so many reasons. But this year I discovered one more. The most basic LEGO Duplo bricks come in lengths of 2 and 4, which is perfect for all the work we do with 4/4. 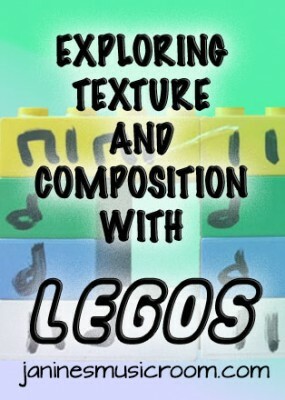 This wasn’t new to me, but what I discovered along the way was how the little studs on top of the Legos would help me teach my students about layering sounds. Using familiar rhythms on our bricks, we composed a four-measure rhythm. Then we added pitches from the pentatonic scale… same old stuff. But then it was time to add layers, creating an interesting texture with drones and ostinati. I’ve always struggled to get my students to understand how important vertical alignment is in ensemble work and in creating a score. Enter Lego! Once we discussed how the beats must line up just like the studs on the bricks must line up, it seemed to click with just about everyone. The Legos helped the children to visualize the layers and their alignment. They also made a very clear picture of how the texture changes when sounds are layered in different combinations. I see a lot of potential in Legos now. What kinds of manipulatives do you use for working with rhythm?